Anybody who has ever bathed a dog, or allowed them to play in the river or sea, will be familiar with a wet dog shake. How about a dog that is dry, though? Have you noticed that your pet tends to behave the same way when it’s completely dry? Why do dogs shake their fur constantly? Your dog may have irritated skin, an itch that it can’t scratch or an ear infection it’s trying to shake it loose. It’s possible that your dog is shivering or is shaking off an unwelcome feeling. Most of the time it’s harmless, but it helps to understand your dog’s body language. It’s possible that your dog is trying to let you know something important by shaking themselves off when you’re nearby or observing them. 1 What is the Difference Between Shaking and Trembling? 1.1 Why Do Dogs Shake When Wet? 1.8 Why Do Dogs Shake Their Heads? What is the Difference Between Shaking and Trembling? Shaking is a behavioral exercise that has a meaning that can be resolved on the spot. Trembling, sadly, is often a sign that your dog is sick and should be taken to see a vet. PetHelpful provides information on this subject and helps up assert whether our dog is trying to tell us something or is experiencing a medical emergency. If you spot any of these symptoms and they appear to be out of character for your canine, get them to a vet. It’s possible that your pet has consumed something toxic (chocolate or chewing gum that contains xylitol, for example), or they may be sick. Remember, not all shaking is necessarily medical, so you’ll have to keep an eye on your dog. If they are letting off one mighty shake then happily going about their business, it was a simple physical action, and there is no need to take any further action. Likewise, some dogs shake and quiver with sheer excitement – if your pooch only displays this behavior when you first get home from work, when you’re about to take them for a walk or while you are preparing their dinner, there is again no need to panic. If they appear to be shaking against their own will, however, seek medical advice. 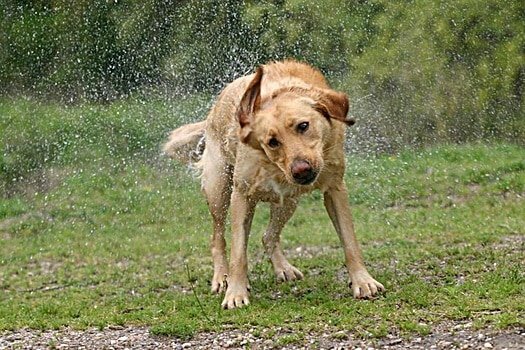 Why Do Dogs Shake When Wet? Our canine companions know how to be efficient. A dog will never take the scenic route if they can get somewhere faster by tromping through mud, muddles, and debris. They will never wait to savor a treat unless they’re told to, “leave it” when they could be tucking in immediately. And, quite understandably, they won’t remain wet for a moment longer than they need to. 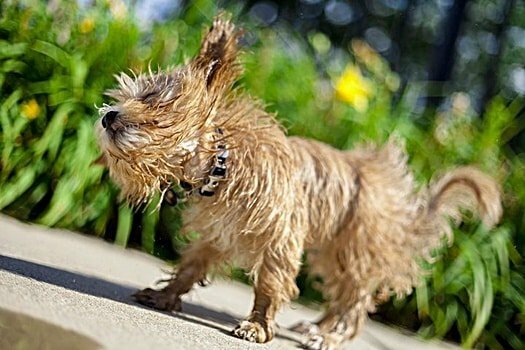 This is why a dog shakes their fur when they are wet. A canine can lose 70% of the water that has pooled within their fur with one single shake – that’s why, if you are unfortunate enough to be standing close by when they do so, you will look like you have taken a shower in the Grand Canyon. This is much faster than waiting for us pesky humans to reach for a towel and brush them off, or turn on the hairdryer – something that may frighten them anyway. 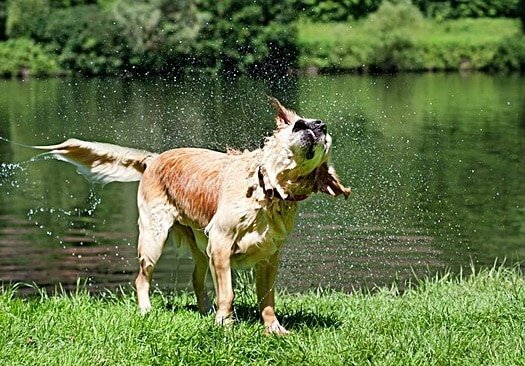 There is more to this compulsion than impatience, though – shaking off the water can be beneficial to your dog’s health. Your dog’s fur coat traps heat from the sun’s rays, warming their skin and keeping them toasty. If this fur is wet, it can’t trap that heat. As a result, your dog will need to burn energy and calories trying to stay warm – exhausting, and potentially dangerous. It could take hours to allow the sun to dry off this fur naturally, and if it’s a cold day, it may not even be possible. They need to find another way of losing than unnecessary, unwelcome water. A dog has significantly looser skin than a human. This means that while they shake, their skin is getting a significantly more prominent workout than it looks. The average dog shakes around five times per second. That’s faster than a large mammal such as a bear but much slower than a tiny rodent. The result is the same, though – they lose 70% of that pesky water from their fur and skin that is preventing them from warming up. Your dog is then free to go about their day, not wasting their energy on staying warm. It’s fascinating to watch, as a dog shaking water from their fur creates a force up to seventy times more powerful than gravity. This is why Fido instinctively closes his eyes while shaking his fur – failing to do so could get very messy indeed. Of course, none of this changes the fact that anybody caught in the vicinity when a dog shakes their fur will be soaked to the bone. Hopefully, however, it will make you more understanding as to just how pivotal the process is for a dog. Your pet is not deliberately drenching you in the name of fun, or as revenge for enforcing an unwelcome bath upon them (though we can’t know for sure that dogs do not consider this to be a welcome bonus) Instead, they’re just trying to stay healthy. As long as this is not a constant tremor that suggests ill health, there is no need to panic. Your dog doesn’t have water on the brain and is not attempting to dry off an imaginary drenching. There are a great many reasons why a dry dog will shake their body when they are dry. One of the most common reasons for a dog shaking at random is that they are having an issue with their skin – often an allergic reaction to something they have eaten or come into contact with. Your dog will often scratch and bite at their skin when they are itching, also possibly whining and asking you to lend a hand and attack the spots that they cannot reach. Shaking is the next best thing to a two-handed scratch for a dog, and rolling around on the ground or rubbing themselves up against door frames may accompany this behavior. If you spot your dog regularly undertaking big, heaving body shakes for seemingly no reason, take a good look at their skin. If you spot any hives, hot spots, bald patches and generally dry, cracked patches of skin, they will likely experience an allergic reaction to something. Follow this discovery up with a trip to the vet, who will be able to run many tests and get to the bottom of just what is irritating Fido so much. When you are out walking, and you have forgotten your coat, or you’re at home and haven’t gotten around to switching on the central heating on a winter’s night, you may start rubbing your arms vigorously in an attempt at staying warm. When your dog shakes their entire body, they are indulging in the canine equivalent of the same activity. Different dog breeds are more and less susceptible to feeling the cold, just like different humans run and different body temperatures. Dogs generally have no interest in being cold, so in addition to shaking, they will probably attempt to snuggle up to their trusted human or sit beside a fire, radiator or another heat source. While they’re out on a walk, they may show signs of discomfort and try to hurry home. You could try popping a jumper or coat on your dog before taking a stroll (especially if they’re reluctant to go out in the rain) if they will allow such a garment – they can be helpful at keeping your pet toasty. If your dog seems to be gently shivering with consistency, trying to make them a hot water bottle to lie upon rather than wrapping them up in blankets – many dogs do not like feeling compressed or ‘trapped’, and with a hot water bottle they can get up and walk away as soon as they feel themselves overheating. If the tremors persist, it may be worth speaking to a vet just in case. Many dogs will shake if they are afraid. Obviously, this will often take the form of regular, low-level tremors during events such as thunderstorms, firework displays or when another canine is in the area that your dog is a little scared of, but your pet may also give a vigorous, full body shake. This is where the term, “shake it off” stems from – your dog has felt a substantial amount of adrenaline, and nervous energy build up in their body, and they are attempting to remove it from their person physically. They may be successful, as sometimes a dog manages to reset their mental and emotional equilibrium with a good shake. This is something to keep an eye on, as it may tell you a lot about your dog and how they feel about interactions with others. If your dog shakes every time a stranger (or even you!) stops petting them, it could mean that they were merely tolerating the experience all along and felt slightly uncomfortable throughout. Likewise, if you notice your dog shaking at seemingly random moments, take a look to see if there is ever a common factor. It could be a particular sound, smell or sight that is making them feel uncomfortable. It’s not all doom and gloom when it comes to a dog shaking, though. Some hounds simply let loose because they are in a great mood and they don’t care who knows it. It’s a canine equivalent of getting their groove on and twerking to Beyonce, and it’s certainly more appealing than jumping and nipping when excited. Dogs can also release pheromones through exercise, so they may just be shaking because it’s fun to do so. Think of it as your dog eliminating those last few traces of excess energy, and relaxing their muscles that have been given such a workout. This could also be a friendly message to other dogs that your dog has had a whale of a time, but they have now finished playing and would prefer not to be involved any longer. Sometimes the simplest solution is the one that makes the most sense, and that certainly applies to a dog that’s shaking. It’s entirely possible that your pet knows that shaking their entire is a surefire way of capturing your attention, especially if they wear a metal collar that clanks and makes a noise when they do so. This can quickly become shorthand for wanting or needing something from you. Oversee your dog when they shake, and try to work out if they are trying to prompt the same reaction from you every time. If you can work the shake into a voice command, so much the better. Some dogs, for example, may stand by the door and shake if they need to use the bathroom. If you have a command word for such activity, try to coach your dog into shaking their fur when you say it as a confirmation that this is what they want. Of course, there could be a plethora of things that your dog could be telling you by shaking. They could be announcing that they are hungry, and the shake is a way of nudging you toward the kitchen. They could be trying to get your attention to come and look at something they deem suspicious, and you have trained them not to bark in such scenarios. Of course, it’s also more than likely that they want a scratch, a tickle, and a little cuddle. Whatever the reason, teaching your dog to shake when they want something can be a great way of coaching them into non-verbal cues. Incorporating it into your dog’s repertoire of communication could hugely benefit you both. When a dog shakes their head, they are not disagreeing with something that you have said or expressing disappointment in your actions. Instead, this behavior is commonly associated with an ear infection that is plaguing your pet, or a foreign object getting stuck within it. The latter can, in fact, often lead to the former. Your dog won’t be able to scratch, rub or pick at their itching and aching ears, nor can they pluck a piece of seaweed or a stone from their ear canal. A good, sturdy shake of the head in an attempt at clearing the lines is the next best thing that your pet can manage with their physical limitations. Otitis Exterior, an inflammation of the ear canal that is identifiable by red swelling around the ears. This could be a result of mites in your dog’s ear, a build-up of wax that has not been cleaned out, or most commonly, an allergic reaction. Ear Vasculitis, which usually impacts upon floppy-eared breeds. This condition is also inflammatory and causes the outside of the ears to scab over and eventually break open and bleed. Ear Hematoma, which is a result of your dog shaking their head. When their ears connect with their skull, your dog can develop a blood pocket known as a hematoma that will form an irritating lump on the skin. Naturally, this will lead to more head shaking! If you suspect that your dog has an ear infection, make an appointment with a vet. These infections are rarely overtly dangerous or a warning sign of any other underlying health condition, but they can be very uncomfortable for a dog and lead to a huge amount of irritation. Thankfully, they are often easily treated with medication – though your dog may also need to wear a collar to keep them calm. If you have ever attended a yoga class, you will be familiar with the position called the ‘downward dog.’ It’s named after the big stretch that every canine tends to give when they wake up feeling refreshed from a great night’s sleep of hogging your covers, snoring and poking you with their claws, safe in the knowledge that they’re cute enough to get away with such japery. What most yoga teachers will not include, however, is the big old shake of the head that a dog will also incorporate into their morning routine. If this is the only time that your pet tends to give their head a wobble, you don’t need to worry about possible infections or to call a vet – it’s just instinctive behavior that has been carried over from your pet’s wild ancestors. While as humans we can shuffle down the stairs and throw coffee down our necks before starting our day, wild dogs were never granted that luxury. Canines never knew when they might have to start running to escape a larger predator or hunt their own prey. As a result, dogs instinctively stretch and shake their heads when they wake up to ensure that they are appropriately limber for any physical activity that might be necessary, and shake off any cobwebs of the previous night’s sleep. A dog is typically ready to be active from the moment they wake up – though naturally, a domesticated pet is equally likely to snuggle back into a blanket as soon as they realize that it’ a winter’s day and it’s pouring with rain outside. 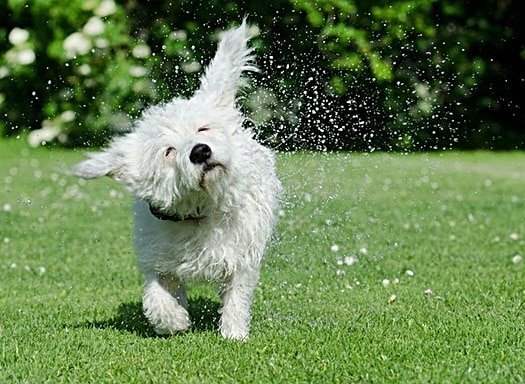 Shaking is natural a part of dog behavior as playing, running and eating – it’s not just something that canines do when they find themselves soaking wet. Provided your dog does not appear to be continually experiencing tremors, there is nothing to worry about when they seem to give the occasional shake. Shaking is well worth paying attention to. 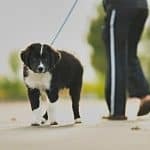 You may well find that your pet is using body language to reveal something to you that will make both of your lives considerably easier in the future. Just make sure you take a step or two backward if they are emerging from the bathtub.